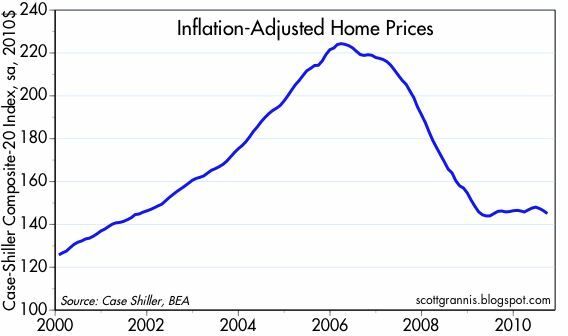 This first chart shows the inflation-adjusted value of the increasingly-popular S&P/Case Shiller Home Price Index. Prices have been essentially flat for the past 18 months. It's tempting to see a bit of weakness in the most recent months, however. Many observers are calling for a renewed decline in prices due to a flood of foreclosed homes hitting the market once the "robo-signing" problem gets straightened out. My view for some time has been that prices have fallen by enough already to clear the market and establish a new equilibrium level. In real terms, the average house price has fallen 35% from the early 2006 peak, and is only 15% above the early 2000 levels. Taking into consideration that 30-yr fixed rate mortgage rates have declined from 6% in early 2006 to 4.5% currently, that equates to an effective decline in the monthly cost of purchasing a home of about 50%, not to mention the fact that real personal incomes are up over 6% since 2005. Do prices really need to fall further? The second chart shows the Case-Shiller index of housing prices in 10 major markets (the first chart includes 20), and it includes data back to 1987. Prices today are 44% above the level of 1987, which equates to an annualized rate of gain of 1.5%. But again, this is less than the rise in real personal incomes (which averages about 3% per year), and less still considering that mortgage rates were in the low double-digits in 1987. 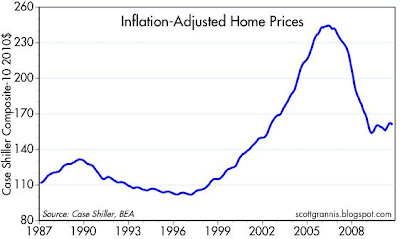 Houses are far more affordable today than they were in 1987. This last chart is an updated version of the one in Robert Shiller's book, "Irrational Exuberance." 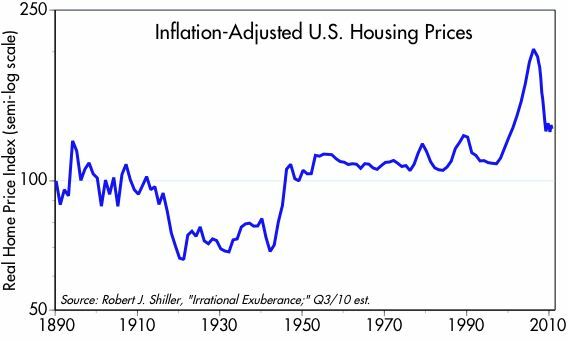 This inflation-adjusted index extends all the way back to 1890. Here we see that current real housing prices are 32% above their 1890 levels, which equates to an annualized rate of gain of only 0.2%, far lower than the rise in real incomes. It's no wonder that the average person can buy bigger and better houses today than their ancestors did. None of these charts rules out a further decline in prices, but they do lend support to the view that prices have declined meaningfully to date, and are no longer out of line with historical price trends. Considering the ongoing rise in real personal incomes and the historically low level of mortgage rates today, the average home price has never been more affordable. 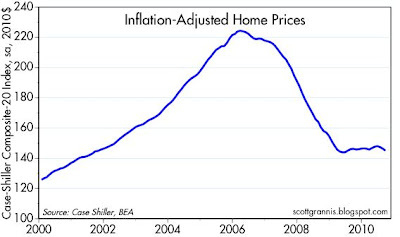 I can't rule out further home price declines, but I think they are very unlikely. With all the hand-wringing in recent days over the ramifications of the Irish bailout and the continued struggle of the other PIGS to avoid default, I thought this chart might have a calming effect. To the extent that the DAX index of German stocks is representative of conditions in general in Europe, what it shows is that Europe is in fact in better shape than the U.S. German stocks, priced in dollars, have modestly outperformed U.S. stocks since the end of the recession, and over the past 15 years. You wouldn't guess it from the hand-wringing headlines, but today the DAX is only 2.7% below its recent, post-recession high. 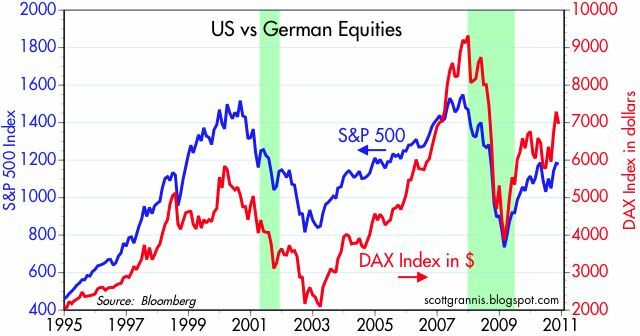 European stocks underperformed noticeably in the late 90s and early 00s, but that was mainly due to a sharp and pronounced depreciation of the euro, which hit a low of 0.827 against the dollar (37% below its value today) in late 2000 and was very weak through 2002. As the chart above shows, 2-yr Euro swap spreads are elevated, but that merely confirms that European markets are nervous about what is going on. 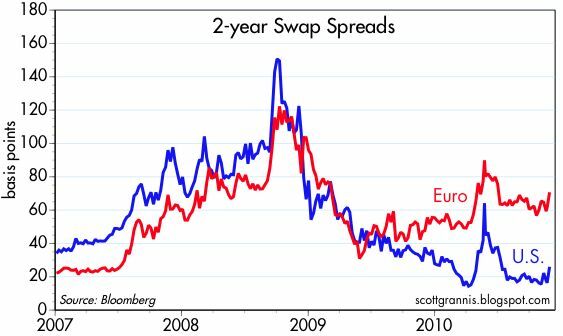 Swap spreads aren't nearly high enough, however, to suggest that there is a serious level of systemic risk or fundamental lack of liquidity in Europe. Defaults and bailouts are not pleasant, but they aren't life-threatening, at least at the present time. As long as markets remain liquid, factories keep operating, and folks continue to show up for work, the European economies should continue to plod ahead, albeit rather slowly, as is the case here in the U.S. There's a nice op-ed in today's WSJ by Kurt Hauser in which he reiterates his observation, first made over 17 years ago and dubbed "Hauser's Law," that regardless of how high income tax rates are, there appears to be an upper limit (about 19%) on the share of total income that can be captured by the federal government. If the same amount of revenue (as a % of GDP) can be realized with two different tax rates, it's obviously preferable to use the lower rate, since this minimizes the distortions that arise when marginal tax rates are high. The charts above and below provide the data to back up key portions of the article, parts of which I include here, but it's worth reading the whole thing. The Obama administration's budget projections claim that raising taxes on the top 2% of taxpayers, those individuals earning more than $200,000 and couples earning $250,000 or more, will increase revenues to the U.S. Treasury. The empirical evidence suggests otherwise. None of the personal income tax or capital gains tax increases enacted in the post-World War II period has raised the projected tax revenues. 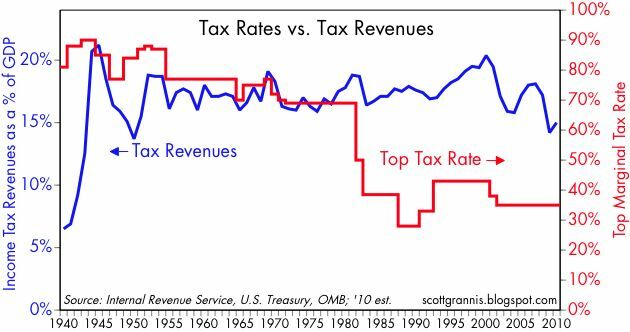 Over the past six decades, tax revenues as a percentage of GDP have averaged just under 19% regardless of the top marginal personal income tax rate. Why? Higher taxes discourage the "animal spirits" of entrepreneurship. When tax rates are raised, taxpayers are encouraged to shift, hide and underreport income. Taxpayers divert their effort from pro-growth productive investments to seeking tax shelters, tax havens and tax exempt investments. This behavior tends to dampen economic growth and job creation. Lower taxes increase the incentives to work, produce, save and invest, thereby encouraging capital formation and jobs. Taxpayers have less incentive to shelter and shift income. The target of the Obama tax hike is the top 2% of taxpayers, but the burden of the tax is likely to fall on the remaining 98%. The wealthy have the highest propensity to save and invest. The wealthy also run the lion's share of small businesses. Small businesses have created two-thirds of all new jobs during the past four decades and virtually all of the net new jobs from the early 1980s through the end of 2007, the beginning of the past recession. The Obama administration is also proposing an increase in taxes on capital itself in the form of higher capital gains and dividend taxes. The historical record is clear on this as well. In 1987 the capital gains tax rate was raised to 28% from 20%. Capital gains realizations as a percent of GDP fell to 3% in 1987 from about 8% of GDP in 1986 and continued to fall to below 2% over the next several years. 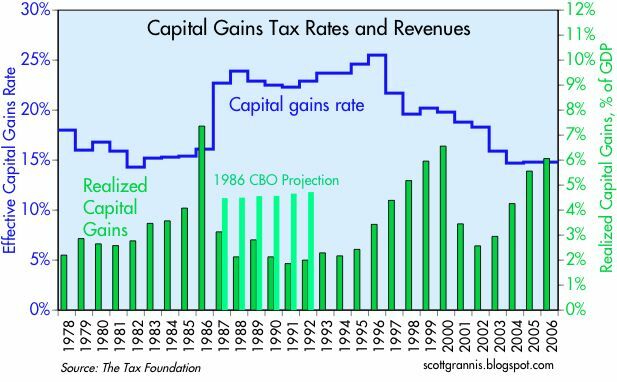 Conversely, the capital gains tax rate was cut in 1997, to 20% from 28% and, at the time, the forecasts were for lower revenues over the ensuing two years. In fact, tax revenues were about $84 billion above forecast and above the level collected at the higher and earlier rate. Similarly, the capital gains tax rate was cut in 2003 to 15% from 20%. The lower rate produced a higher level of revenue than in 2002 and twice the forecasted revenue in 2005. Two years ago the U.S. economy was in the depths of one of the worst recessions in my lifetime. Financial markets were priced to the expectation that the economy was headed into a deep depression that would be far worse than anything ever seen before. At one point, corporate credit spreads and equities were priced to the belief that as many as half the companies in the U.S. would be bankrupt within 5 years or so. There were lots of forecasts of unemployment reaching as high as 25%. 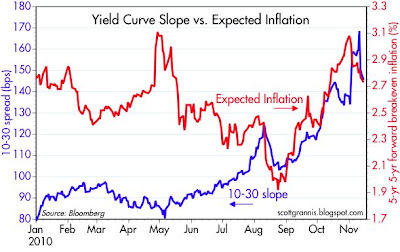 The bond market expected to see years of outright deflation. Financial markets all over the world we gripped by panic, and many thought we were on the verge of a global financial collapse. I hope I never have to live through anything like that again. Yet here we are, two years later, and the economy is growing and deflation is a no-show. 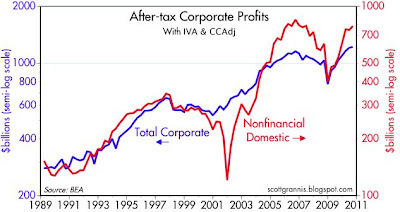 Corporate profits are at record levels, and consumers are getting back on their feet. The unemployment rate is still at a very painful 9.5%, but there are signs that job creation is going to be slowly ramping up. The political winds have come full circle, and fiscal policy looks set to favor the growth of the private sector, rather than the public sector. Financial markets have not yet made a full recovery, but there has been tremendous progress. I'm hopeful we'll see continued progress on all fronts, and I'm encouraged by my unshakable belief in the dynamism of the U.S. economy, the power of free markets, the entrepreneurial spirit which has created so many jobs and brought us such widespread prosperity, and the willingness of just about everyone to work hard so that we can give our children a better life. I'm excited to be a part of the internet age, since it enables the dissemination of good ideas at the speed of light, and because I believe that good ideas will always triumph over bad ideas. Finally, I'm thankful to my many readers and to all those who have contributed so many constructive comments and questions. May everyone have an enjoyable Thanksgiving. If only everyone could also enjoy the spectacular weather we're having here in So. California! Fed governors have told us quite a few times this past year that they are extremely concerned about the possibility that the US economy might fall into a deflationary trap. 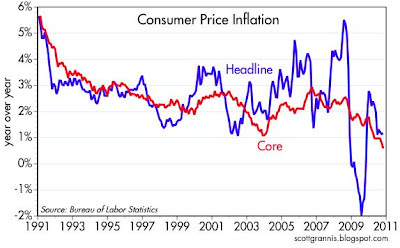 They have explicitly stated that the current rate of inflation is "too low," below their target rate of inflation. 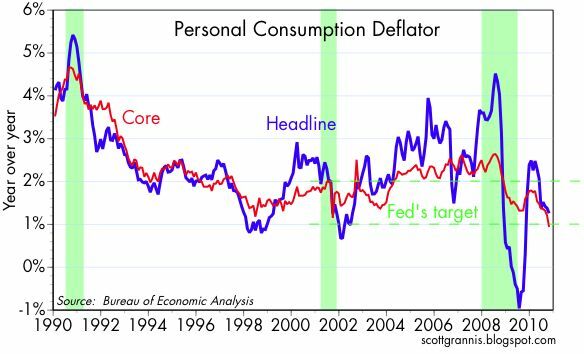 In that context I offer the above chart, which shows the year over year change of the personal consumption deflator, the Fed's inflation measure of choice, since it is a broader and more dynamic index than the CPI. The October reading on the PCE deflator was 1.26%, while the core version was 0.94%, slightly below the 1-2% target the Fed introduced some years ago. I note that both measures of inflation were above their target for about 5 years (2004-2008) without this triggering unprecedented action on the part of the Fed to bring it down. Is deflation really such a bad thing that the mere hint of it should justify the use of unprecedented quantitative easing measures? If I were on the Fed board, I would have been much more concerned about the upward drift in inflation earlier this past decade than about the recent downdraft. To trot out the example of Japan, as many, including the Fed, are wont to do—where it is presumed that Japan's deflation has been the scourge of its economy for the past two decades—is not very constructive, since the differences between the U.S. and Japan far outweigh the similarities. To begin with, Japan's deflation is directly attributable to its monetary policy. 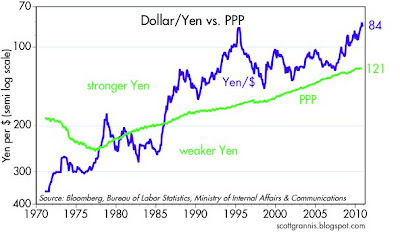 The Bank of Japan has managed to keep money so tight for so long that the yen has appreciated against every other currency on the planet for many years. This appreciation is fully explained by the fact that Japan's inflation rate has been much lower than that of other major economies, particularly that of the U.S. The chart below shows how the yen's purchasing power parity (PPP) has risen steadily since the late 1970s, due to Japan's lower rate of inflation, and how the yen has basically followed that same path. The U.S. has had no similar experience with monetary deflation, so there are no parallels with Japan. Furthermore, there is no reason to think that a mild deflation such as Japan has had should be the cause of two decades of disappointing growth. For one, Japan is unique among major industrialized nations in that its population is much older, and the growth of its labor force has been much slower (Japan's demographics have now resulted in a decline in its working-age population). Japan also has suffered from decades of extremely "expansionary" fiscal policy which has burdened the economy with a debt/GDP ratio of well over 100%. For my money, Japan's disappointing growth has much more to do with too much government spending (which is always very inefficient) than anything else. That's the parallel with the U.S. that makes sense to worry about. Yields on 10-yr Treasuries are up 50 bps from their October lows, which were the lowest yields since the panic of late 2008. We can safely assume that yields were driven to those extremely depressed levels by the prospect of another round of quantitative easing—the market was front-running the Fed's plan to purchase Treasuries. Since then the Fed has confirmed its intention to purchase up to $600 billion of Treasuries, but yields have nevertheless jumped by half a percentage point. That's the market's way of flashing a big thumbs down to QE2. The bond market last summer was worried, as was the Fed, that the economy was in trouble and needed more help. But now things have changed, and the bond market has figured out that the economy is not in desperate need of more money. The economy is not on the verge of a double-dip recession—it is growing and it's likely that growth in the current quarter will be stronger than the third quarter. Moreover, dumping more money into the economy can only increase the risk of higher inflation, at a time when virtually all commodities have been rising for almost two years, gold prices have been in a decade-long rally, and the dollar is at or near its weakest levels ever. A strengthening economy and the prospect of higher inflation are the bond market's worst nightmare, especially when yields are trading at generational low levels. As I said before, no amount of QE2 can keep Treasury note and bond yields from rising when the fundamentals are pointing to higher yields. 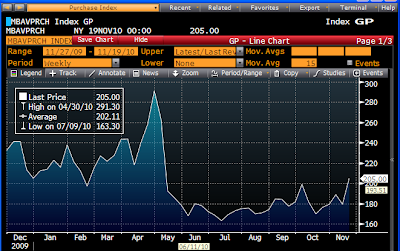 We now see that the bond market vigilantes are beginning to marshall additional forces. 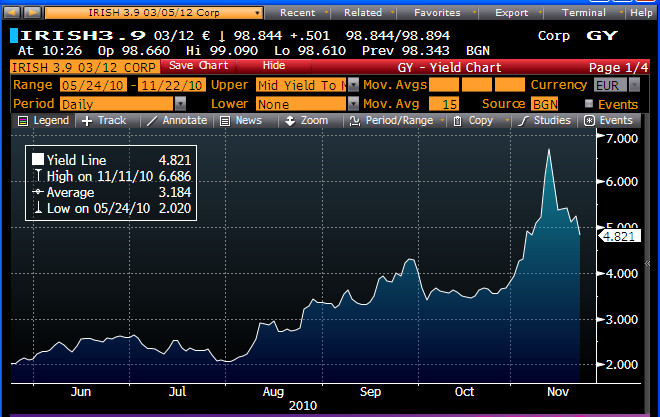 As a result, yields on current-coupon FMNA securities have jumped 67 bps since their October lows. Plus, the spread between MBS and 10-yr Treasuries has widened about by 40 bps since hitting a record low late last July. 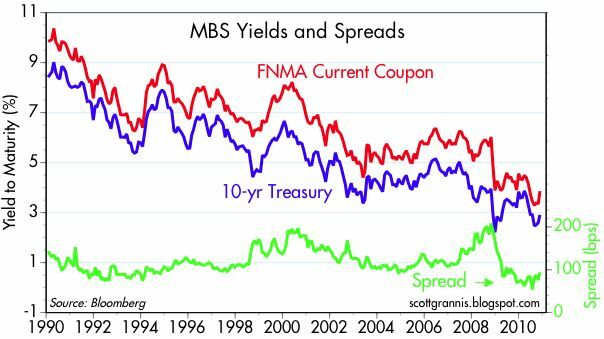 MBS spreads appear to be on their way to 120 bps (if not eventually much higher), which is the average level of the spread over the past 20 years. Maybe the Fed will be able to keep Treasury yields marginally depressed (i.e., distorted), but they can't keep MBS yields down forever. And maybe it's not just the bond market vigilantes at work here, maybe it's also the case that demand for mortgages is rising, as I pointed out in my earlier post today, which noted that new applications for mortgages are up 25% since last July. This is really turning into the bond market's worst nightmare, and we're likely still in the early stages of a big selloff. Mortgage-backed securities have a unique characteristic which can fuel near-panic conditions when the economic and financial fundamentals change unexpectedly. It's called negative convexity: the effective duration (interest rate sensitivity) of MBS increases when yields rise, and decreases when yields fall. Back in July, mortgages had a duration of just under 1 year, because the market expected to see massive prepayments of mortgages due to the big decline in yields up to then. Mortgages now have a duration of a little over 3 years, which means they are three times more risky to own if yields continue to rise. When yields fall, rising prepayments effectively turn mortgages into very short-maturity bonds, but when yields rise, then declining prepayments can turn mortgages into very long-maturity bonds. The latter is what's happening now, and it's causing large institutional investors who are holding sizeable positions in MBS to scramble to hedge their increasing exposure to rising interest rates. The main way they hedge (i.e., shed unwanted duration) is to sell Treasuries. This augments the selling pressure that has already served to drive Treasury yields up by 50 bps. Higher yields will dictate even more selling of Treasuries to avoid bigger losses on MBS holdings. The Fed is powerless to stop this higher-rate locomotive, especially since it's being driven by improving economic fundamentals and the perception that inflation risk is rising. One way for this drama to end is for the Fed to call off QE2, and I suspect that will happen before too long. That will still leave in place the forces (e.g., an improving economy and rising inflation risk) that are driving yields higher, but higher yields on Treasuries are not going to derail the recovery. 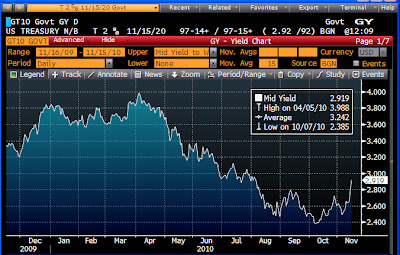 Given how low yields still are, rising yields are symptomatic of a stronger economy, not a threat to the economy. Full disclosure: I am long TBT and long a 30-yr fixed rate mortgage at the time of this writing. Good news from the housing market: new mortgage applications are up 25% from last July's low. 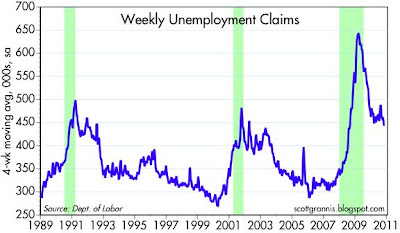 First time claims for unemployment plunged last week on a seasonally adjusted basis. The data had been hinting at some significant underlying improvement for the past several weeks, and now it is confirmed. 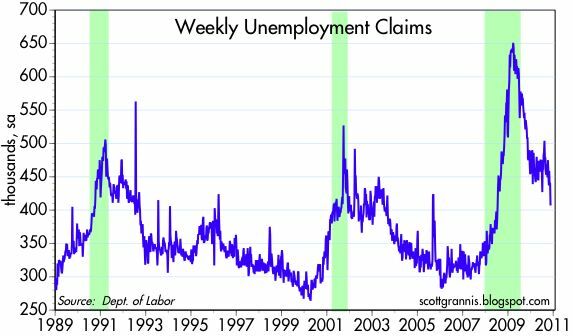 Of course, the drop in claims doesn't mean that businesses are hiring; rather, it means that they are not firing as many people as they ordinarily would be at this time of the year. 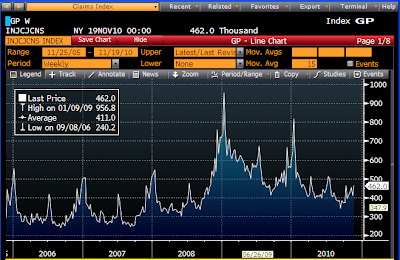 The next chart, which shows the actual, non-adjusted claims, makes that clear. For the past five years claims have always been on the rise in November, but they have hardly risen at all this year. Regardless, I think it's fair to say that conditions in the labor market are definitely improving. Capital goods orders apparently came in below expectations, but prior months were revised higher, and faulty seasonal adjustment factors are still muddying the waters. The 3-month moving average of orders solves the seasonal problem, and the result, as shown in the chart, is that orders continue to move higher at a pretty impressive pace. Over the past year, capex is up 15%, and over the past six months, orders have risen at a 10.5% annualized rate. A quick visual comparison of the rebound from the recent recovery compared to the rebound after the 2001 recession says it all: today things are getting better, faster, than they did in the years following the 2001 recession. Of course, it is still the case that orders haven't broken new high ground for the past 10 years. But it is nevertheless encouraging that orders are rising at an above-average clip, since that means that business confidence is being restored. 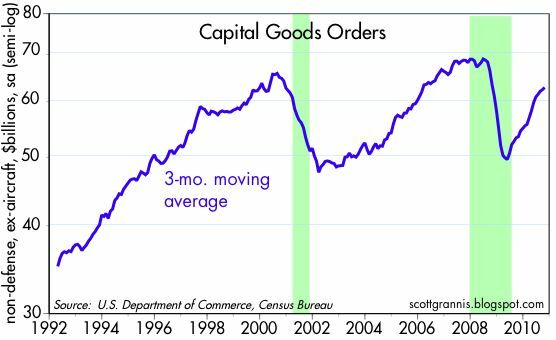 Capital goods orders are also the seedcorn for future productivity gains, and that means the outlook for future economic growth is improving. The Federal Reserve's quantitative easing program began over two years ago, and it has since triggered waves of concern and countless forecasts (including mine) of rising inflation. To date, the fears have not been validated by any meaningful rise in the official inflation statistics—indeed, some measures of core inflation have fallen to record lows, as I noted in this post the other day. How can the Fed have engineered an explosive and unprecedented increase in its balance sheet without there being any noticeable impact on the economy and on inflation? The short answer is that quantitative easing has not yet resulted in any meaningful increase in the amount of money in the economy. What follows is a rather long but illustrated survey and discussion of the important evidence surrounding the Fed's experiment in quantitative easing. 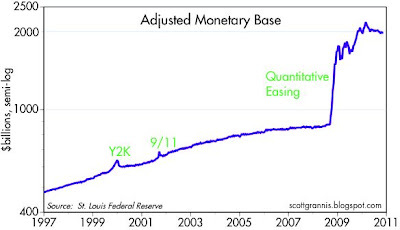 Although there's no evidence of any meaningful monetary expansion resulting from QE2, there does appear to be enough excess money relative to money demand to cause a future rise in inflation. This first chart goes to the core of the expansion of the Fed's balance sheet, which has been accomplished by the purchase of over $1 trillion of MBS and Treasury securities. When the Fed buys an asset of whatever kind, it pays for it by crediting a bank with "reserves." Reserves are not money in the ordinary sense, but they can be used by banks to increase their lending and thus to increase the amount of money in the economy. Banks are required to hold about $1 in reserves for every $10 in deposits in our fractional reserve banking system, so an extra trillion in reserves could theoretically allow an almost unimaginable increase in the amount of money in the economy. Since quantitative easing first got underway, the problem the Fed has faced is that either banks are unwilling to lend more, or borrowers are unwilling to borrow, or both. 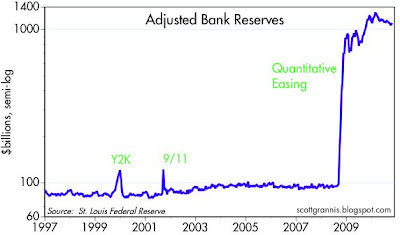 The vast majority of the reserves created through the Fed's quantitative easing program sit idle on the Fed's balance sheet as "excess" reserves, as shown in the above chart. $1 trillion of excess reserves is stark testimony to the ineffectualness of QE, but also to the fact that QE has eliminated any possibility that the economy is suffering from a shortage of money. This next chart shows currency in circulation. 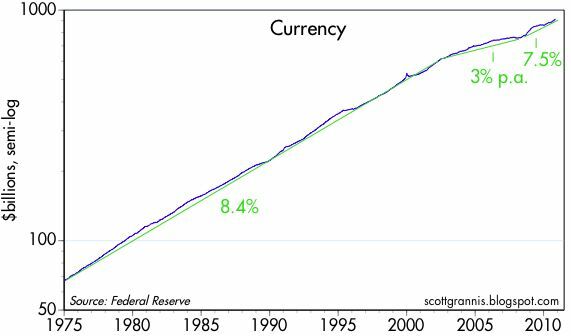 Currency can only increase if banks ask the Fed to exchange their reserves for currency, and it takes $1 of reserves to get $1 of currency. Currency in circulation, while one of the components of the money supply, can also be thought of as a measure of money demand, since people only hold dollar bills (which pay no interest) if they serve some purpose (i.e., to facilitate transactions or as a store of value). The Fed can't force more hundred dollar bills into the economy than people are willing to hold, because unwanted dollars are easily returned to banks in exchange for deposits. As the chart shows, the growth of currency in circulation has been unusually slow for most of the past decade, up until the financial panic of late 2008 when demand for dollars surged. 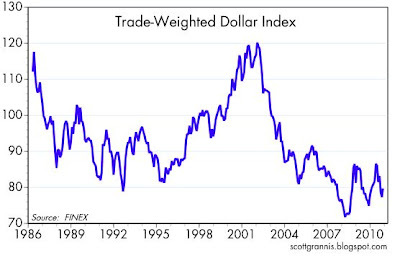 Plus, the ups and downs of the dollar have tended to coincide with the rise and fall of the dollar's value, as shown in the next chart. (The recent divergence of the red and blue lines is an unusual development that bears watching.) I should also note that a large portion of U.S. currency in circulation is held overseas (most likely over half), so currency growth can be a misleading indicator of conditions in the U.S. economy. But to summarize: the relatively slow growth of currency and the dollar's general weakness in the past decade are signs of declining dollar demand, and not a sign that the Fed has been too tight or that there is a shortage of money. 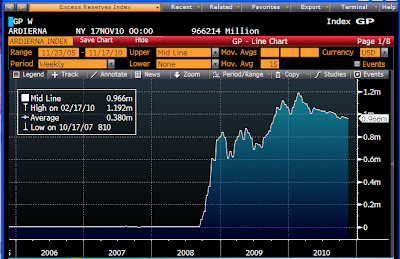 The next chart (below) shows the Monetary Base, or "high-powered money." 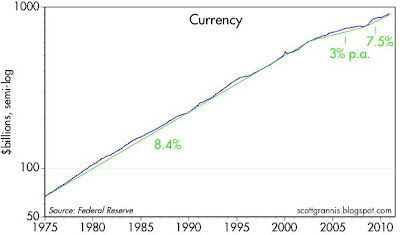 The base consists of bank reserves plus currency in circulation (i.e., the sum of the first and third charts). This is the part of the money supply that the Fed can control directly by buying and selling securities. 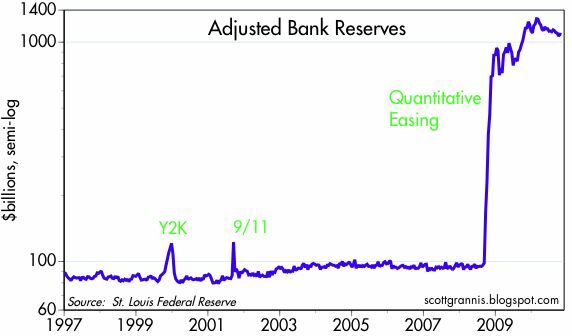 Note that the base has expanded in a fashion similar to that of reserves; both grew exponentially in the first phase of quantitative easing. 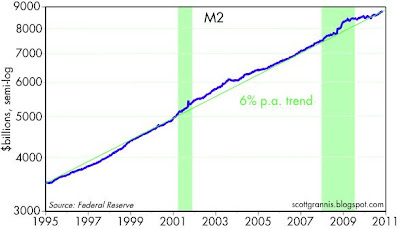 Note from the chart above that M2 has grown on average about 6% per year since 1995. That's a little faster than the 5% annual growth of nominal GDP over the same period. 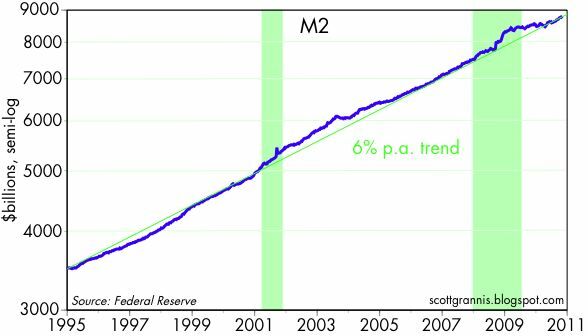 But if we assume that over half of the growth in currency (a component of M2) was due to voracious overseas demand for $100 bills, then M2 growth has been quite similar to the growth in nominal GDP since 1995. 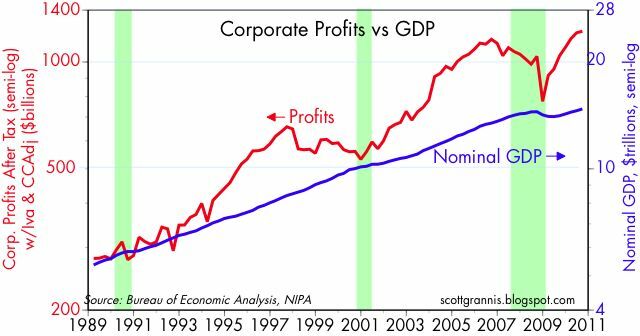 With money growing at about the same rate as growth in the nominal economy, there is no obvious reason to think that the Fed or the banks have been creating too much money. This is not a case, in other words, of "too much money chasing too few goods." Note also how M2 growth surged in late 2008 in response to the economic and financial crisis. Fears of an imminent collapse of the world's financial system caused a huge, safe-haven-driven increase in the demand for money of all forms. People and businesses wanted to hold more money in their checking accounts, and they wanted to deleverage in order to reduce their risk. (Paying back loans is equivalent to increasing one's holdings of money.) 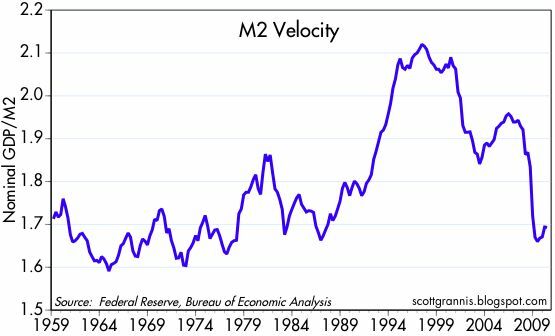 Since then, M2 growth has slowed back down to its long-term trend. Nowhere do we see any sign of an unusual expansion of the money supply that might have resulted from the huge increase in the monetary base over the past two years. So, up to this point we can conclude that although the Fed has injected over $1 trillion of reserves into the banking system, this has not resulted in any unusual expansion of the amount of money sloshing around the economy. Banks apparently have not been aggressive lenders, and borrowers have, in aggregate, not been eager to borrow. The extra reserves the Fed has created are not being utilized by banks to increase the amount of money in the economy by more than we might otherwise expect to see. Since the Fed now pays interest on reserves, the banking system effectively views reserves as similar to T-bills: they are risk-free instruments that carry a modest yield. The Fed has essentially swapped T-bills that it has created for bonds. The Fed is now bearing a substantial amount of yield-curve risk (and the market is thus bearing less), since higher bond yields could result in large losses to the Fed's balance sheet. Collectively, banks are sitting on a mountain of low-interest-paying cash, presumably in order to fortify the health of their balance sheets. Now we turn to market-based indicators of the balance between money supply and money demand. While it is easy for the Fed to add up all the "money" in the economy (e.g., M2), it is quite another thing to know whether the amount of money that has been supplied to the economy is sufficient to satisfy the economy's demand for money. No one knows how to quantify money demand except after the face. But, as Art Laffer frequently reminds us, we can infer what the demand for money is doing by simply observing the behavior of market-based measures of the price of money. For example, if we know there has been a bumper crop of apples, and we know that the price of apples has been falling, then we can conclude that the demand for apples has not been as strong as the supply of apples. 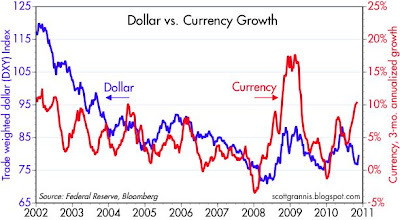 The two charts above show the market-based value of the dollar relative to other currencies. The first one uses nominal values and a basket of only major currencies, while the second one uses inflation-adjusted values and a very large basket of trade-weighted currencies. 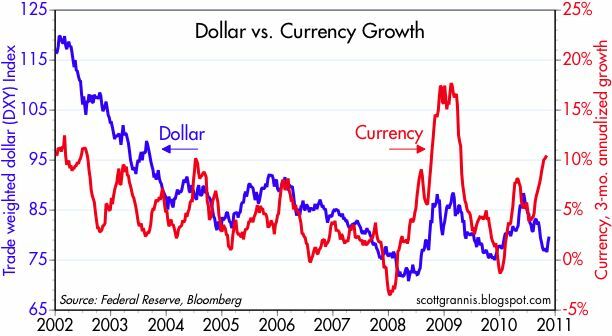 Both show that the dollar is at or near the low end of its historical valuation range. This can only mean that the amount of dollars being supplied to the world under the Fed's guidance has exceeded the world's demand for dollars. Demand for dollars has been generally weak, while the Fed's willingness to supply dollars has been very generous. An over-supply of dollars, in turn, sets us up for the classic "too much money chasing too few goods" problem. 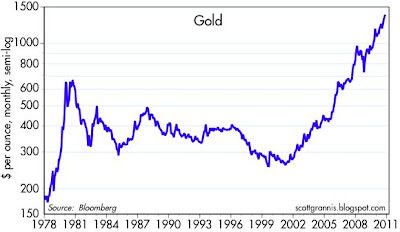 The chart above shows the dollar's value relative to gold. 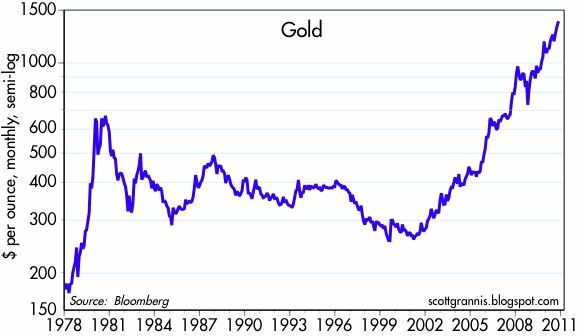 Gold prices have been in a strong uptrend (i.e., the dollar has been steadily losing value) ever since the Fed started easing in early 2001. As with the dollar, this strongly suggests that the Fed has been over-supplying dollars to the world. The market finds itself with unwanted dollars, and that encourages people to exchange some of their dollars for gold, since gold has been a trusted store of value throughout the ages, as well as being the favorite of speculators betting that quantitative easing will eventually prove inflationary. 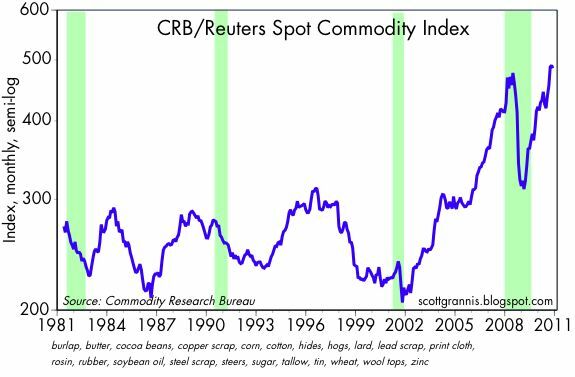 The chart above shows the dollar's value relative to a basket of non-energy, industrial commodities. 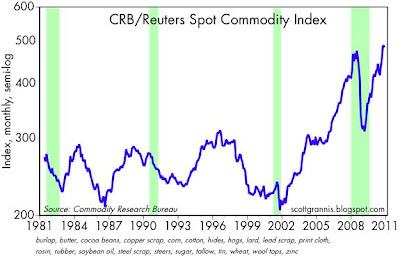 This too suggests that there is an over-supply of dollars in the world—too many dollars chasing a limited supply of commodities, pushing their prices ever-higher. 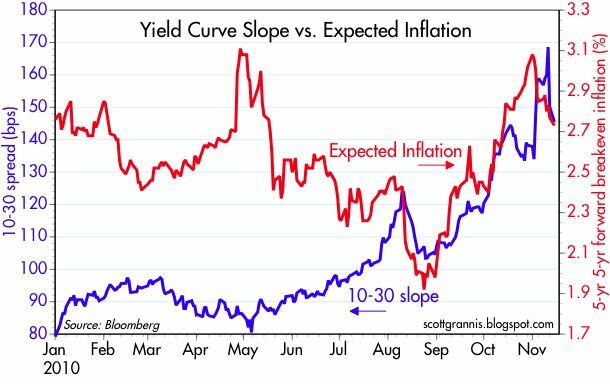 The chart above compares the slope of the long end of the Treasury yield curve to the market's forward-looking inflation expectations, as embedded in the pricing of TIPS and Treasuries. A steep yield curve (the long end of the curve is almost as steep as it has ever been) is a classic indicator of easy money, and easy money is what eventually gives us higher inflation. 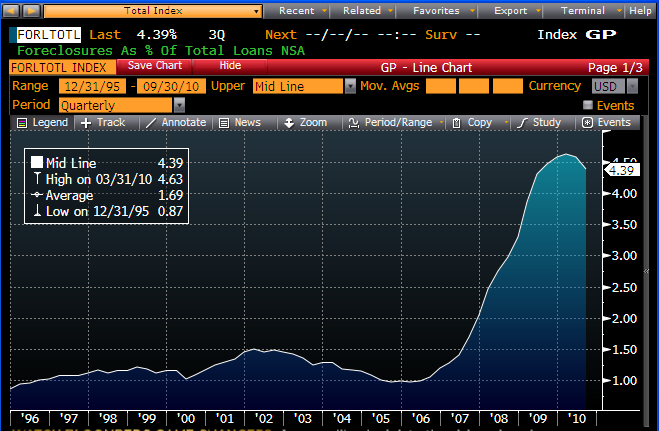 TIPS are priced to an acceleration in the CPI from the current 1.2% to 2.9% within the next 5 years or so. That's not a very scary number, to be sure, but it is definitely higher than the 2.3% annualized rate of inflation over the past 10 years. Will QE2, which promises to create an additional $600 billion of reserves, make banks any more willing to lend, or borrowers more anxious to borrow, or will those extra reserves also just sit idle at the Fed? We can only wait and see, but I have to believe that at some point banks' willingness to sit on an ever-growing pile of T-bill substitutes paying almost no interest will begin to wane. Banks likely will be increasingly tempted to put their reserves to work, taking advantage of credit spreads which are still historically wide and a yield curve that is historically steep. But even if banks do begin lending more and M2 expands more rapidly, will that boost growth as the Fed is hoping it will, or will it simply fuel more inflation? I take the view that easy money can only boost growth if a prior lack of money is holding the economy back. You can't print your way to prosperity, but a central bank can help its economy by pursuing an appropriate monetary strategy. As is evident from the above discussion, however, that is manifestly not the case today—we are not suffering from a lack of money, so more money will only be inflationary. 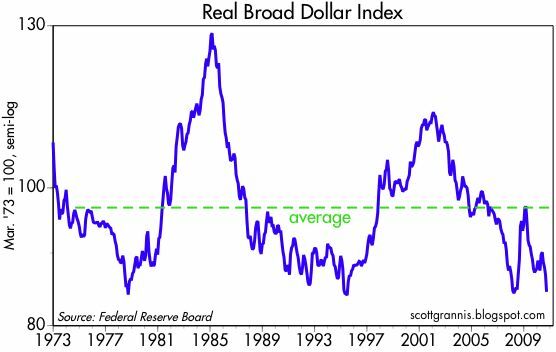 Meanwhile, the Fed is attempting to boost the supply of dollars at a time when the demand for dollars is relatively weak—not exactly the conditions that make for a sturdy equilibrium. As the next chart shows, the velocity of M2 has been relatively low since the depths of the recent recession, and it has plenty of room to increase if money demand falls further and people decide to spend some or all of the cash that they have been hoarding. Rising money velocity could boost the economy temporarily, but it could also fuel rising prices. Supporters of QE2, such as Mark Thoma, argue that no harm has been done yet, and that the Fed can quickly and easily reverse its quantitative easing if signs of trouble appear. That may be true, but it is also the case that the Fed is attempting a balancing act that could deteriorate faster than its ability to react. Plus, the potential gains from QE seem ephemeral at best, while the downside risks seem potentially huge. I would hope that arguments such as I have advanced here will continue to put pressure on the Fed to back off from a full implementation of QE2. The sooner the better. Monetary policy is not a good tool for micro-managing the economy, and the Fed shouldn't even attempt it, especially now. UPDATE: Robert Barro has a nice essay on QE2 here that touches on many of the same themes. He questions the effectiveness of QE2 as expansionary policy, and he worries that the Fed does not have a good or easy exit strategy. 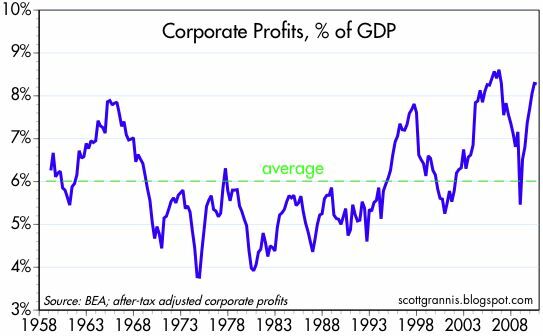 With the recent revision to third quarter GDP, we see that corporate profits after tax hit a new record high of $1.22 trillion. 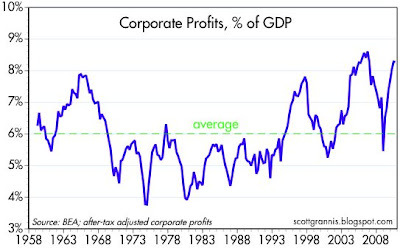 Relative to GDP, profits have only been higher in six of the past 209 quarters. 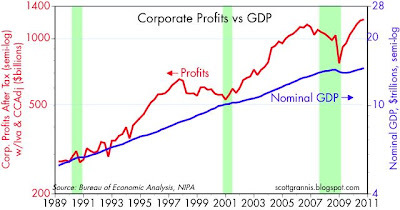 As I've noted before, what strikes me most about the corporate profits picture is that today the S&P 500 is unchanged from where it stood in November 1998, yet after-tax corporate profits have surged 120% since the end of 1998. 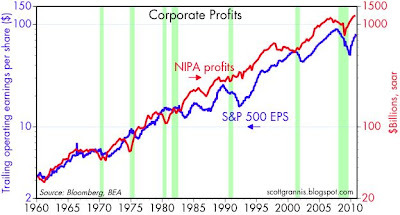 In this next chart, I have used a normalized S&P 500 index as the "P" and NIPA after-tax profits as the "E" to generate a history of PE ratios. 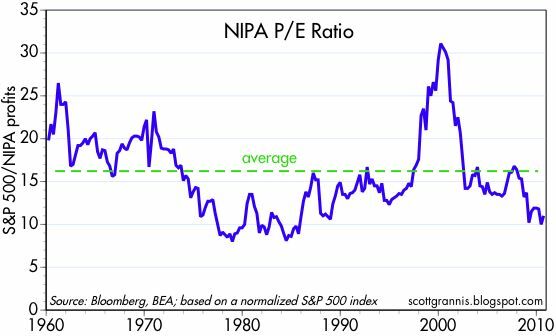 (These ratios are not meant to be comparable to the PE ratios you see for the S&P 500 based on reported profits, but they do give you an idea of how the market's valuation has changed over time.) This exercise shows that stocks were clearly overvalued in 2000, as we now know, and it also shows that stocks have rarely been as undervalued as they are today. Indeed, by this measure they are almost as cheap as they were in the early 1980s, on the eve of what later proved to be a two-decade-long equity boom. The only explanation that makes sense for why stocks are so cheap today is that the market is expecting interest rates to rise, tax burdens to rise, and corporate profits to fall—all of which would contribute to severely depressing the discounted present value of future after-tax earnings. If your crystal ball is not so pessimistic, then stocks are a buy. 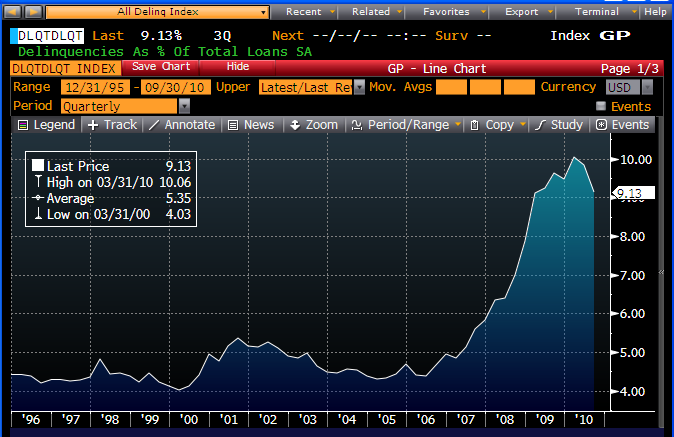 Nominal GDP is now at a record high as well, having fully recovered from the recent recession. Real GDP is only 0.6% below its late-2007, and if the 2.5% growth rate of Q3/10 is repeated in the current quarter (a safe bet, is my guess) then real GDP will hit a new all-time high in just five and a half weeks. 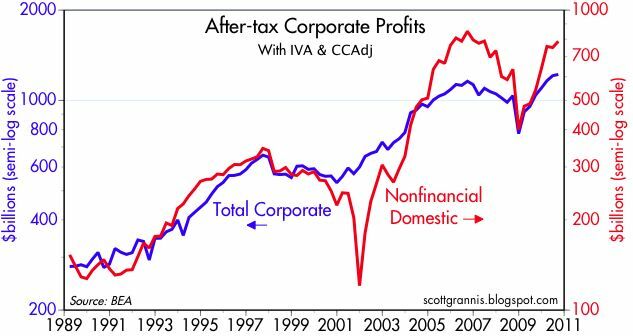 As this next chart implies, profits have been strong not only for nonfinancial companies, but for the financial sector as well. As Brian Wesbury notes, "The gain in profits in Q3 was mostly powered by domestic financial companies, whose profits increased at a 46% rate." This next chart compares NIPA profits to S&P 500 earnings per share. 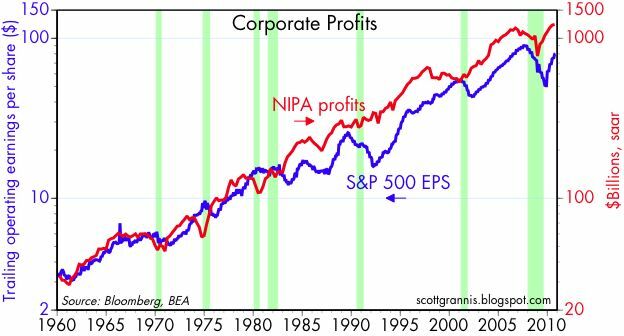 As should be evident, NIPA profits are not only more stable than reported profits, but they also have a strong tendency to lead reported profits. The very strong recovery in NIPA profits since late 2008 thus portends further substantial gains in reported profits, which were up 34% in the 12 months ended October. All in all, some very encouraging news for equity investors. Portugal, Ireland, Greece and Spain are still having sovereign debt problems. Even though the EU is working hard to patch over the problems, credit default spreads for these issuers have risen significantly. Once again the world is worrying whether these problems will lead to the collapse of the euro and/or serious problems for European economies. As this chart of swap spreads suggests, the problems, while serious, are not nearly as bad today as they were at the peak of the global financial crisis in late 2008. Moreover, the systemic risk posed by the sovereign debt problems of the PIGS is even less today that it was in early summer. 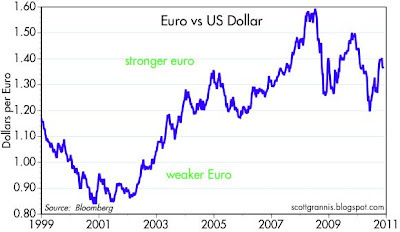 This chart of the euro vs. the dollar suggests that the euro is far from being on the verge of disintegrating. 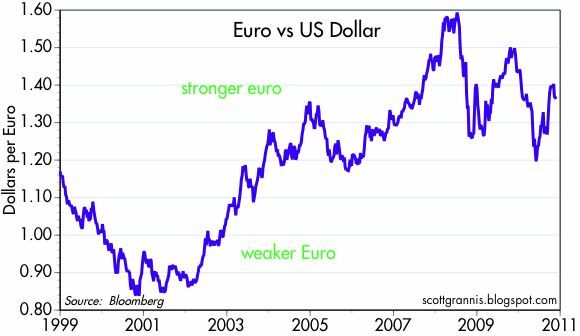 Indeed, the euro is doing pretty well relative to the dollar, and is not too far below its all-time high against the dollar. 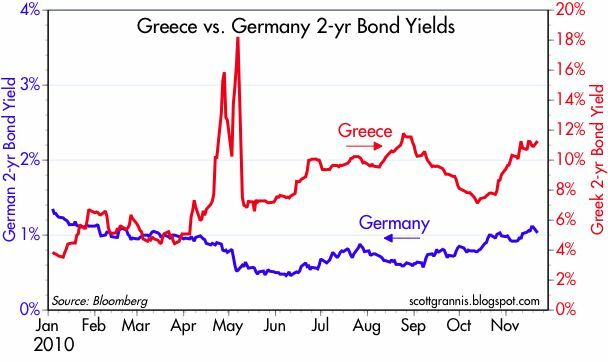 This chart shows that the yield on Greek short-term debt is elevated relative to German debt, but far less than it was last May. The bond market is thus telling us that there is a decent chance that Greece will default, but that is by no means a done deal, and even if Greece were to default, it would not likely bring down the core of Europe. 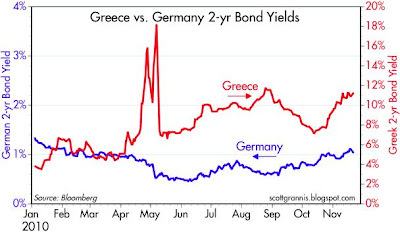 German yields were much lower last summer when the market was very concerned that Greek contagion could result in a much weaker European economy. Today, German 2-yr yields are about twice the level of US yields, suggesting that the prospects for European growth are actually better than for the US. In that regard, I note that Germany's DAX index today is at a post-crisis high not seen since the second quarter of 2008; that's further support for the idea that Europe on balance is doing OK, despite the problems of the PIGS. As this chart shows, the yield on Irish 2-yr government bonds has dropped significantly in the past week or so, suggesting that the financial rescue package being put together for Ireland has substantially reduced its near-term default risk. The yield on 10-yr bonds has also fallen of late, but remains very elevated at just over 8%. 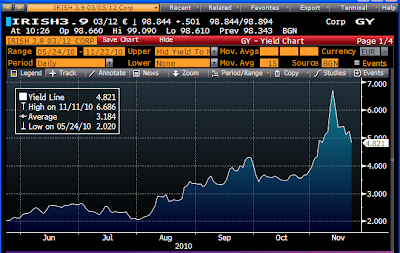 That puts Irish bonds on a par with junk bonds, which on average are currently yielding 8.2%. Ireland is definitely a credit risk, but it is not a portent of great financial destruction or impending economic collapse. This recovery has been slow, and agonizingly slow for all those exposed to the real estate market. The top chart shows mortgage delinquencies as a % of total loans, while the bottom chart shows foreclosures as a % of total loans. Both reached record-high levels early this year. There's been some progress since then, but we still have a long way to go before the real estate market gets back to anything that might be considered normal. Lots of pain and suffering out there, and it's going to be a hard slog for at least the next year or two, even though it is nice to see that we have turned the corner and are moving in the right direction. If there is any consolation to be found here, it is that this problem (record-high delinquencies and foreclosures) has been with us for quite some time now, and the market has had plenty of time to adjust prices and take losses. It is very likely that all the losses that are going to come out of the real estate market have already been priced in, and all the bad news has been digested. Undoubtedly there are many homeowners who haven't yet accepted the fact that they have lost lots of equity in their homes, but the market has most likely figured it out by now. The worst is over, and now the economy and the market can slowly put things back together. 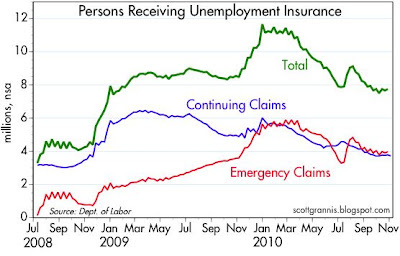 Seasonally adjusted unemployment claims (top chart) last week fell to a new 4-wk. moving average low for the year. 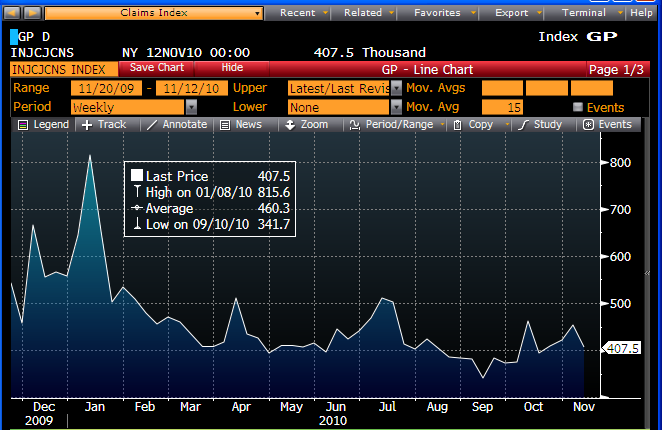 Actual claims (second chart) have been flat since late April. 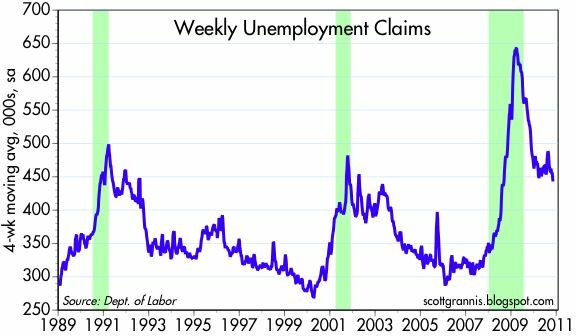 In a typical year, actual claims would have been rising at this time of the year, but that is not happening, so adjusted claims are falling. Either way you look at it, the labor market is doing better on the margin, and that is good, even though progress is slow. 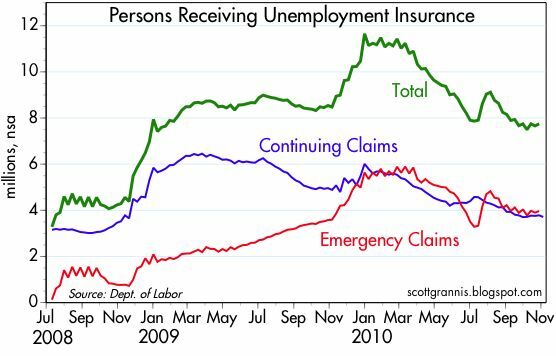 Meanwhile, the total number of people receiving unemployment benefits—about 7,750,000—has not changed much in recent weeks, and remains quite elevated. The big news on the inflation front today is that the 12-month change in the October Core CPI fell to 0.6%, the lowest rate of inflation in the history of the index, which began in 1957. 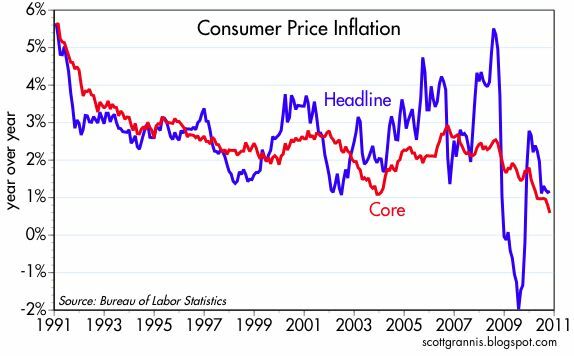 Even the headline CPI was up only 1.2%, which ranks as among the lowest rates of inflation since the low-inflation, early 1960s. To add to the "inflation-is-very-low" news, the CPI index today is still lower than it was in July '08! Yikes, that means we've had over two years of deflation! This presumably makes the Fed governors feel more comfortable with their view that inflation is now "too low" and needs to be pumped up a bit. But with all due respect (a scarcer commodity these days among many reputable economists), I think they are mistaken. This next chart shows the CPI index less energy, which represents a little less than 10% of the CPI. Since oil prices peaked in July '08, non-energy prices have increased 2.3%, and they have increased despite a wrenching recession and almost a year and a half of 9.5% unemployment. Thus, one big reason the overall CPI is so low is that, since Aug. '08, we've seen oil prices fall by almost half; natural gas prices fall by more than 80%, and gasoline prices fall by 30%. The other big reason for low CPI readings is the housing market. As Brian Wesbury has noted repeatedly, one of the key factors depressing the CPI over the past year or so has been the government's estimate of how much rent homeowners would be paying if instead of owning their house they were renting it. If you subtract owner's equivalent rent from the CPI and look just at things that people are actually spending money on, then the CPI would be up 1.5% in the past year. Since owners' equivalent rent is now beginning to increase, after falling from mid-2009 through mid-2010, an important source of lower inflation in the past year or two will begin to add to CPI inflation in the months and years to come. Consider: owners' equivalent rent makes up about 25% of the CPI, is currently unchanged over the past 12 months, and averaged about 3% per year for the 10 years prior to the housing market bubble. If it were to return to 3% a year, owners' equivalent rent could add 0.75% annually to the CPI. This next chart comes from a relatively new and very intriguing source, the Billion Prices Project @ MIT (HT: Mark Perry). The chart compares the year over year change in the CPI (blue line) with the year over year change in the price of a basket of millions of consumer-oriented items as priced daily by MIT via online sources. There are some key prices, however, that aren't included, such as energy, cars, transportation, and services such as education, health, and tourism, but those only account for about 40% of the CPI. Despite this, MIT reports a high correlation between their data and the CPI. 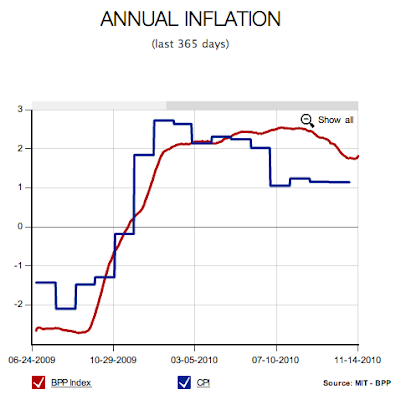 In any event, the MIT project is reporting inflation of about 1.8% over the past 12 months, compared to the 1.2% gain in the CPI and the 0.6% gain in the core CPI. One more reason to think that the CPI may be under-reporting inflation. 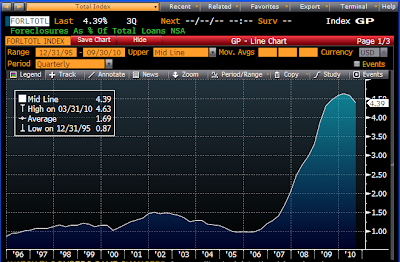 If the MIT index were to include cars, it would be registering even higher inflation, as this next chart suggests. 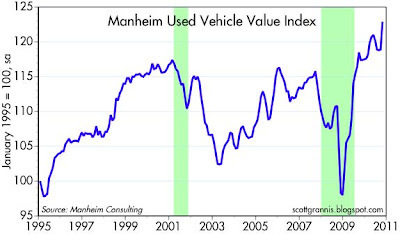 According to the folks at Manheim Consulting, used car prices rose 4.7% in the past year. Since the end of 2009, used car prices have rebounded over 25% to a new all-time high, despite the fact that the economy has not fully recovered, and the labor market is still struggling with 9.6% unemployment. If there is any deflation out there, it can be found mainly in the energy and housing sectors, both of which experienced a huge runup in price in the years prior to 2008. In my book, that's not deflation, it's pay-back. 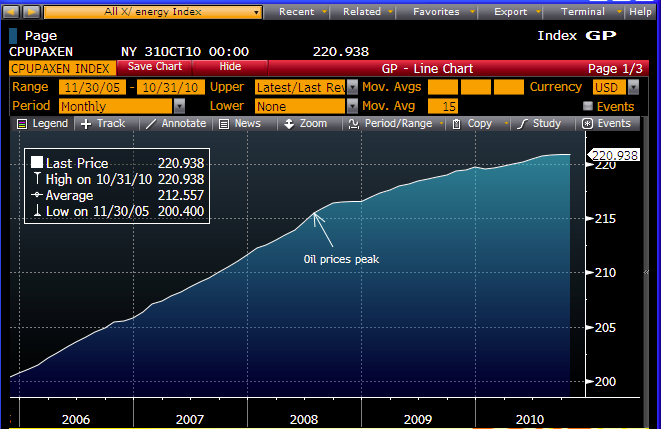 Almost anywhere else you look, prices are rising. Producer prices rose 4.3% in the 12 months ending in October. Measured over the past 3 years—to eliminate the extreme volatility of 2008—producer prices are up at a 2.4% annual rate. Excluding food and energy prices, the producer price index is up 1.4% in the past year, and over the past three years, it's up at an annual rate of 2.2%. 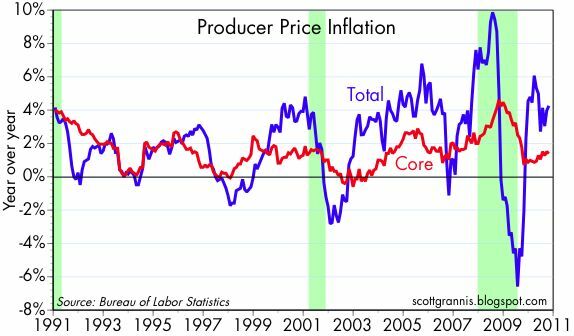 No sign of deflation here, and if anything I detect a gentle upward bias in the pace of producer inflation since 2003, which not coincidentally was when the Fed first began to adopt an aggressive accommodative policy stance. You may see reports that highlight the fact that the rise in producer prices in October was much less than expected, but that needs to be taken with a grain of salt. As Brian Wesbury notes, the unexpectedly small gain in October prices (and the unexpectedly large drop in core prices) was likely due to a seasonal adjustment problem, since "this is the fourth time in the past six years that the core PPI has dropped in October ... and (it) may be due to how the government estimates prices of light trucks, which fell 4.3% in October." US October Industrial Production was unchanged, according to the Federal Reserve, disappointing market expectations of a 0.3% increase. This weakness, however, was mostly due to unusually mild weather which caused utility output to drop 3.4%. The above chart shows the index for manufacturing activity (a subset of the larger industrial production index), which rose 0.6% in October and is up 6.2% in the past year. Over the past six months, manufacturing activity has expanded at a 4.5% annual rate—no sign of any significant slowdown or double-dip here. 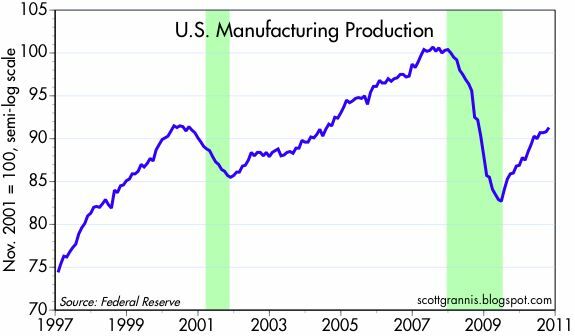 I note that the rebound in manufacturing activity following the 2008-09 recession has been much stronger than the rebound following the 2001 recession, even though activity is still about 9% below its late 2007 peak. We've got a ways to go before breaking new high ground, but we're making progress at a decent rate. This is impressive, and augurs well for real change in Congress. Nearly every day that the Senate’s been in session for the past two years, I have come down to this spot and said that Democrats are ignoring the wishes of the American people. When it comes to earmarks, I won’t be guilty of the same thing. Make no mistake. I know the good that has come from the projects I have helped support throughout my state. I don’t apologize for them. But there is simply no doubt that the abuse of this practice has caused Americans to view it as a symbol of the waste and the out-of-control spending that every Republican in Washington is determined to fight. And unless people like me show the American people that we’re willing to follow through on small or even symbolic things, we risk losing them on our broader efforts to cut spending and rein in government. That’s why today I am announcing that I will join the Republican Leadership in the House in support of a moratorium on earmarks in the 112th Congress. UPDATE: Even the Democrats are getting the message: Democrat Senator Mark Udall (OH) today called "for an end to the wasteful and influence-laden process of earmarking." After a year or so of relatively stagnant loaded outbound container shipments, the Ports of Los Angeles and Long Beach in October reported increases. (Together, the two ports account for about 40% of U.S. goods exports.) 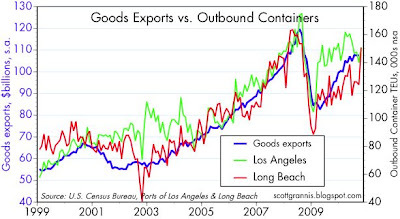 Long Beach, in particular, saw loaded outbound containers jump by 21% from September, and 26% from October '09. Moreover, this was the biggest October export figure ever for Long Beach, which suggests that exports are on track to eclipse their 2008 highs before too long. Since data on outbound container shipments tends to lead official U.S. export figures, this is a good indication that we will see stronger numbers on U.S. goods exports in coming months. And that, of course, feeds directly into stronger GDP. This chart of the yield on 10-yr Treasuries shows the rather dramatic rise in rates that has occurred in the past week. As I mentioned a few days ago ("Return of the bond market vigilantes") the market is not only protesting the Fed's decision to move ahead with QE2, but now appears to be thinking that it might be cancelled or significantly cut back. This coincides with mounting opposition from all quarters to the idea of QE2, culiminating in today's release of an open letter to Bernanke from a group of notable economists and investors. As I've said before, QE2 is not only unnecessary but foolish. The sooner it is put out of its misery the better. And to the extent that calling off further QE2 disappoints the market, that is a great buying opportunity for investors who understand that too much money is not a good thing. 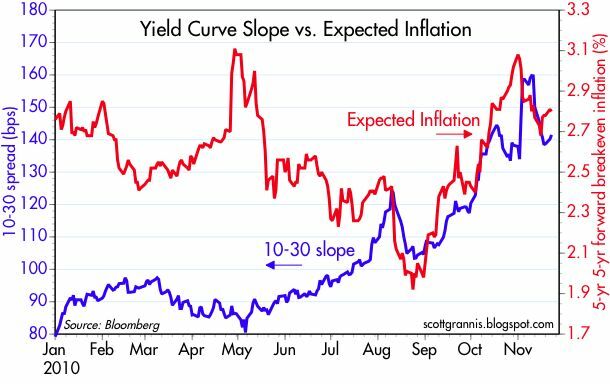 UPDATE: Here is a chart that compares the 10-30 Treasury spread with the market's forward-looking inflation expectations. The action in both is fully consistent with the market changing its expectations about QE2. 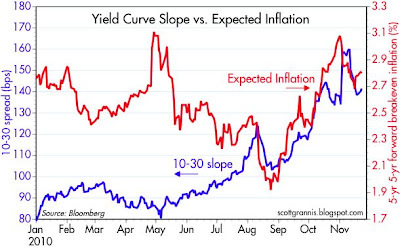 Less QE2 means the 10-30 spread needs to return to more normal levels, and inflation expectations have to decline. This post adds to yesterday's post on the fatal flaws of ObamaCare, and is an update of a post from a year ago. It's valuable information which deserves dissemination. 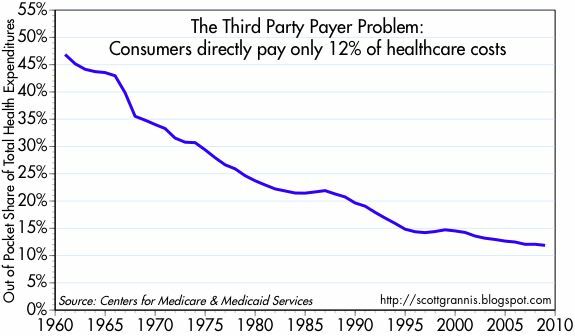 If you could only use one chart to illustrate the fundamental problem with healthcare in the U.S. today, this would be it. 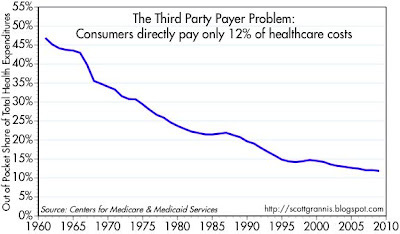 As of the most recent data (2008), consumers paid for only 12% of their healthcare expenses out of their own pocket. Back in the days before WW II, consumers paid for the vast majority of their healthcare expenses out of pocket. That began to change in the early 1940s, when the government agreed to allow companies to circumvent war-time wage controls by giving their workers tax-free health insurance; companies could deduct the cost of the insurance, and it wasn't considered income to the workers. This significant feature of the tax code has finally taken us to its logical conclusion: consumers now get almost all of their healthcare paid for by an employer, since this is highly tax-efficient. The 12% that is still paid out of pocket likely consists mostly of payments by individuals not covered by employer policies, and co-pays by individuals that are covered. Since the vast majority of healthcare expenditures are not paid for by those receiving healthcare services, but rather by a third party insurer or the government, there exists little or no incentive in aggregate for consumers to shop around. That explains the notorious lack of price transparency in the healthcare market, and helps explain why costs have risen at a rate much higher than inflation. To fix most of what is wrong with healthcare, we simply need to fix the tax code. Either allow everyone to deduct the cost of healthcare, or no one. Without the distortion of tax incentives, companies would eventually turn the healthcare purchase decision over to employees. That in turn would restore the proper incentives to consumers, allowing market forces and competition to make healthcare more efficient and more affordable.